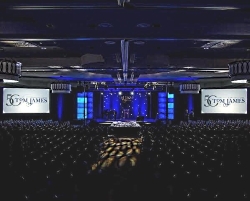 FOH Online gives details from Fontes Pro Sound & Light install at The Mirage, in Medesto, California. Celebrations in the Indian community are serious business. Festivals are typically an unrestrained blend of color, flavor and sound. And weddings, according to George Fontes, managing director of Fontes Pro Sound & Light, are nothing short of high-decibel exhilaration. So, when Mirage, an Indian wedding and banquet hall in Sacramento, CA, contacted him to install a new sound system last month, Fontes turned to FBT. He knew anything he installed would be pushed to concert-level limits and he wanted to ensure crisp, clean sound at every event – wherever guests were standing in 22,000 square feet of space. “There are several reasons I chose FBT for this job,” said Fontes. “One thing I love about the brand is that they don’t outsource; everything down to their amp modules is done in house. You just don’t find that anymore. All of that quality control proves that they really care about their products, and you not only see it – you hear it. The Washington Nationals installed eight FBT Mitus 206L speakers at the main entrance of Nationals Park. 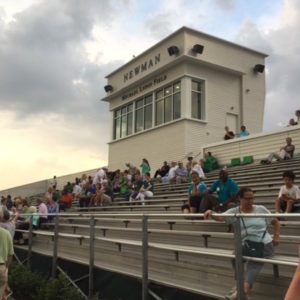 The new speakers, installed by Tuxedo Moon, will broadcast announcements and pre-game entertainment as fans enter the stadium. Durrell Sports chooses Muse 210LA arrays and Mitus 218S subs to support performances from students and professional musician parents. 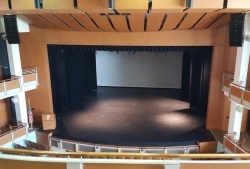 John Horrell, president of Durrell Sports, recently installed FBT loudspeakers in the school auditorium for Music City’s Ensworth School. With a student body that includes children of Nashville’s resident musicians, high-quality sound is consistently needed to support school shows as well as the many performances given by parents – professional musicians who enjoy the opportunity to raise money for the school. Technologies For Worship‘s article about how FBT, and Texas Systems have revitalized Fellowship Church’s audio for worship. “We knew we needed to fix our audio, so we contacted Jim Martin at Texas Systems Integration to configure the perfect solution for our facility… He was able to recommend FBT speakers to us based not only on the price of the speakers, but also the quality of the sound from the speakers as well. ProSound Web’s article about Allied Productions & Sales install for the historic watering hole, Lee’s Liquor Lounge. 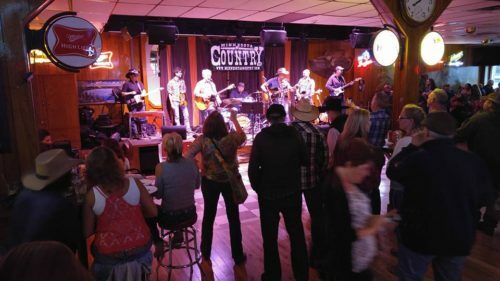 When Craig Kruckeberg purchased a Minneapolis honkytonk in a building that was built in the 1800s, he faced a few challenges that would have stumped a lot of professionals. Thanks to FBT and Dave Bartholomew, sales manager and project manager of Allied Productions & Sales, a sound system didn’t have to be one of them. Picture from Lee’s Liquor Lounge website. Bartholomew, who has been in the audio business for over thirty years, says there were plenty of other reasons why he and his lead installation tech and rigger, Cody Anderson, chose FBT for the job.